McAlister Residence Hall is a six story building housing approximately 530 students at the corner of St. Philip and Vanderhorst Streets. Constructed in 2002, McAlister Hall features community spaces including the 1st floor Activity/Study Room, central courtyard and 24-hour information/ security desk. McAlister Hall is arranged with all suites opening to outside corridors. Each suite consists of 2-3 bedrooms, 2-3 bathrooms and 1 living room with kitchenette. 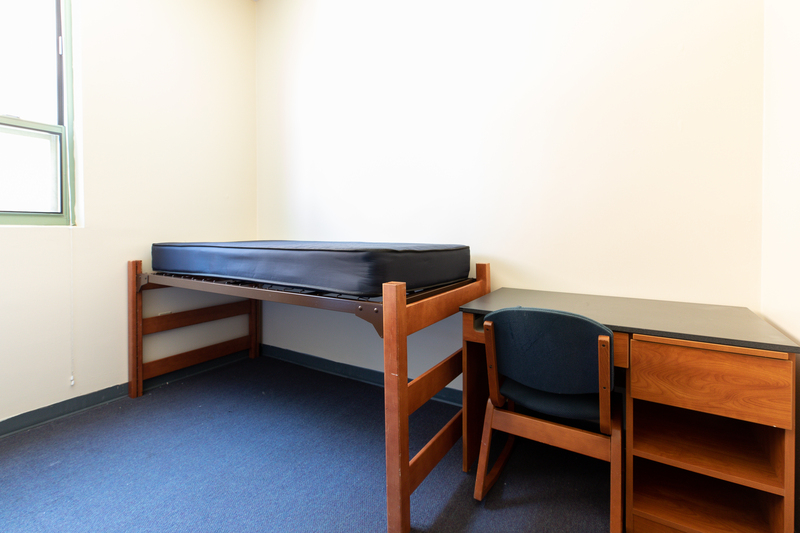 All suites are shared by 4-6 students and all bedrooms are shared by two residents. McAlister is air conditioned has central laundry on the ground floor which is free, and the building is equipped with IPTV and WiFi. McAlister is also home to Einstein Brothers Bagels which offers a wide variety of fresh baked bagels, sandwiches, salads, pastries and homemade desserts. Bedroom dimensions may vary according to specific location, but typical bedrooms measure 10’-6” wide x 11’ long, not including the dressing, closet and bath areas. Desks measuring 42” wide x 24” deep x 30” high. One window, 46” wide x 70” high (larger in 5th & 6th floor “tower” rooms). All windows are covered by 1” aluminum mini-blinds. We do not allow wall or frame fastened curtain rods, but students may drape fabric from the valance of the blinds.